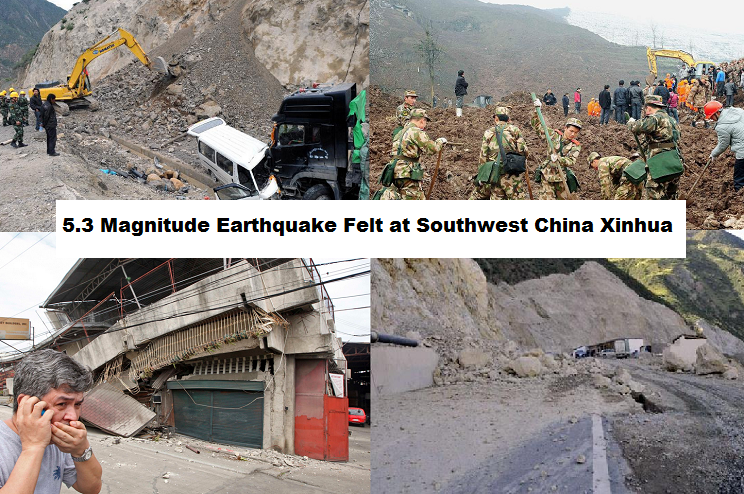 April 5, 2014; A terrifying shallow 5.3 magnitude earthquake felt at Southwest China: Xinhua Saturday. The residents of southwest China runs from their homes as terrified from the earthquake as dozen of houses (20 houses) collapsed and at least ten people were reported injured on the indecent. The shock were felt at Yongshan County on Yunnan Province with epicenter 13 km deep in Xiluodu , at 6:40 a.m. Saturday, April 5, 2014, according to the China Earthquake Networks Center. According to the the county government's information office, two of the injured are in a serious condition, two roads were blocked by fallen rocks, and twenty houses collapsed. Quick response were done and one road has since reopened. Communications in the area were not affected. The Rumors that began spreading about the quake was said caused by the nearby Yongshan near Xiluodu hydropower project which was China's second largest hydropower station that is only 15 km from the epicenter. According to the news Zhang Jianguo of Yunnan Disaster Prevention Research Institute denied that there is any evidence linking the quake and the power plant.